If, as Rick Perlstein says, "there's no such thing as a conservative think tank," there are some pretty accomplished conservative bamboozlement organs. At the top of that dubious heap is the American Enterprise Institute, under whose auspices we find the latest embarassing attempt by right-wing intellectuals to pretend that inequality isn't a serious problem in America. You almost have to stand in awe of an institution devoted to churning out arguments about "The Upside of Income Inequality." Grounding their analysis in a rather strange comparison between the US and China and India, Gary Becker and Kevin Murphy return to the conservative canard that inequality in America is largely a factor of the increasing value of college education. In fact, they use weasel words to avoid making a solid claim, arguing for instance that "much of the widening gap in incomes reflects the rising payoff for a college education and other skills." Emphasis mine: so, how much? Politicians and many others in the United States have recently grown concerned that earnings inequality has increased among Americans. But as the example of China—or India, for that matter—illustrates, the rise in inequality does not occur in a vacuum. In the case of China and India, the rise in inequality came along with an acceleration of eco­nomic growth that raised the standard of living for both the rich and the poor. In the United States, the rise in inequality accompanied a rise in the payoff to education and other skills. We believe that the rise in returns on investments in human capital is ben­eficial and desirable, and policies designed to deal with inequality must take account of its cause. In 1980, an American with a college degree earned about 30 percent more than an American who stopped education at high school. But, in recent years, a person with a college educa­tion earned roughly 70 percent more. Meanwhile, the premium for having a graduate degree increased from roughly 50 percent in 1980 to well over 100 percent today. The labor market is placing a greater emphasis on education, dispensing rapidly rising rewards to those who stay in school the longest. 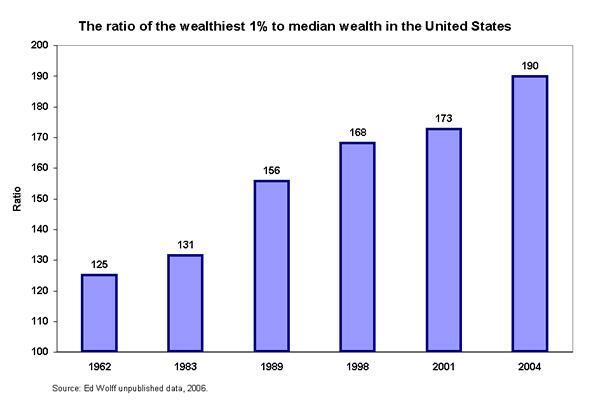 The richest 1% of wealth holders had 125 times the wealth of the typical household in 1962; by 2004 they had 190 times as much or $14.8 million in wealth for the upper 1% compared to just $82,000 for the household in the middle fifth of wealth. Income inequality grew significantly in 2005, with the top 1 percent of Americans -- those with incomes that year of more than $348,000 -- receiving their largest share of national income since 1928, analysis of newly released tax data shows. [P]erhaps more than half of the rise in economic inequality in the United States involves the growing divergence of workers with the same level of education. In other words, people with the same number of years of schooling have much more disparate economic experiences than they used to -- and that means that investing in education, wise as it may be, is also increasingly risky. Hacker points out that even as education has become vastly more expensive -- the average debt burden for college graduates is now $20,000, and for grad students it's twice that -- "advanced skills nonetheless provide no sure guarantee of economic stability"; people who make specific investments in particular skills or industries are especially vulnerable. There's no way to dodge the issues: crisis-level inequality in America is real. Economic insecurity is real, and getting worse. Having a college education might cause you to make less money than a manager in Publix. Exactly -- again, you're making a specific investment, which makes you particularly well skilled in one area, but doesn't translate well if you can't find employment in that area. Not that I want to discount the value of a college education, but the glib idea that just going to college will get you on the right side of the income gap is silly. Paul, EPI also has charts showing that the education premium STOPPED growing in the early '90s. Hasn't stopped neolibs from pretending it keeps getting bigger every year. Interesting... I should probably know better than to take AEI data at face value. So what can we do about it? Well, not much. Unfortunately, we are stuck on a runaway train. The problem has gone unchecked for too many years. The US/global depression is comming thanks to the 1% club. It would take a massive effort by the vast majority to prevent it. Along with a voluntary sacrifice by the rich. THATS NOT GOING TO HAPPEN. But if you believe in miracles, then spend your money as wisely as possible. Especially in middle and lower class communities. Check the Fortune 500 list and limit your support of high profit/low labor industries (Hollywood, pro sports, energy, credit, pharmaceutical, cable, satelite, internet advertising, video, and music, cell phone, high fashion, jewelry, ect.). Cancel all but one credit card for emergencies only. Call the provider and demand a lower rate. Be persistent. You may get it. If you need a cell phone, then do your homework and find the best deal on a local pre-pay. If you want home internet access, then use the least expensive provider, and share accounts whenever possible. If you need to search, then use the less popular search engines. They usually produce the same results anyway. Don’t click on any internet ad. If you need the product or service, then look up the phone number or address and contact that business directly. Don’t pay to see any blockbuster movie. Instead, wait a few months and rent the DVD from a local store or buy it USED. Then loan it to a friend or family member. If you prefer the outing, then choose a film produced by the lesser known studeos with lower paid actors. If you want to see a big name game or event, then watch it in a local bar, club, or at home on network TV. Don’t buy any high end official merchandise and don’t support the high end sponsors. If its endorsed by a big name celebrity, then don’t buy it. If you can afford a new car, then make an exception for GM, Ford, and Dodge. If they don’t increase their market share soon, then a lot more people are going to get screwed out of their pensions and/or benefits. Of course, you must know by now to avoid those big trucks and SUVs unless you truly need one for its intended purpose. Don’t be ashamed to buy a foreign car if you prefer it. Afterall, those with the most fuel efficient vehicles consume a lot less foreign oil. Which accounts for a pretty big chunk of our trade deficit. Anyway, the global economy is worth supporting to some extent. Its the obscene profit margins, trade deficits, and BS from OPEC that get us into trouble. Otherwise, the global economy would be a good thing for everyone. Just keep in mind that the big 3 are struggling and they do produce a few smaller reliable cars. Don’t frequent any high end department store or any business in a newly developed upper class community. By doing so, you make developers richer and draw support away from industrial areas and away from the middle class communities. Instead, support the local retailer and the less popular shopping centers. Especially in lower or middle class communities. If you can afford to buy a home, then do so. But go smaller and less expensive. Don’t get yourself in too deep and don’t buy into the newly developed condos or gated communities. Instead, find a modest home in a building or neighborhood at least 20 years old. If you live in one of the poorer states, then try to support its economy first and foremost. Be on the lookout for commercial brainwash plots on TV. They are written into nearly every scene of nearly every show. Most cater to network sponsors and parent companies. Especially commercial health care. In particular, high profit pharmaceuticals and excessive medical testing. DON'T FALL FOR IT. Get off the couch and take care of your body the way nature intended. There is no substitute. If you must see a doctor, then DEMAND that he/she give you more than 5 minutes of their undivided attention. Otherwise, dispute their unreasonable charges. Be prepared with written questions about your condition and get them answered one at a time. If they refuse, then dispute their unreasonable charges. If they prescribe excessive medical testing and find nothing new or signifigant, then dispute their unreasonable charges. If they prescribe a pharmaceutical, then ask for a generic. Better yet, concider a change in lifestyle or simple tolerance. If they still recommend the name brand pharmaceutical, then ask about any financial ties or conflict of interest. If they get offended, then dispute their unreasonable charges and consider a new doctor. If you must drug away your sniffles, aches, and pains, then at least do your homework. Be aware of the possible side-effects ahead of time. Don't be surprised to find yourself back a week or two later feeling worse. In which case, you should dispute their unreasonable charges. If you are diagnosed with another medical condition, then ask your doctor what he/she has done to rule out those possible side-effects. Otherwise, dispute their unreasonable charges. Don't let any greedy doctor treat you like a number, make you wait an hour, or rush you out of their office. Otherwise, dispute their unreasonable charges. Don't fall for this CRAP that doctors have no choice but to over-book their time or over-charge their patients because of high overhead. ITS A LIE. YOUR DOCTOR IS MOST LIKELY A MULTI-MILLIONAIRE. So don't fall for their CRAP. Demand their undivided attention and respect. Afterall, they took an oath. Do all of the above regardless of your coverage. Don't force your employer to cover the obscene and often fraudulent charges of a corrupt health care industry. By doing so, you make the problem worse. Keep your guard up when watching ANY talk show. These people are not your friends. They are not your advocates. They are paid actors hired to get your attention and your money. Nearly every word, smile, and stupid joke is rehearsed ahead of time. Including those which take place during what appear to be 'technical oversights' (Today Show). Its all fake. Its all calculated. Nearly every segment is about marketing some over-priced product or service. They will use any excuse to plug a gadget, fashion item, travel destonation, drug, movie, TV show, book, magazine, song, website, ect. Almost all of it over-priced. Almost all of it resulting in higher profits for their sponsors, partners, and parent companies. DON'T FALL FOR IT. Big business is fine on occasion depending on their ethics, profit margins, and profit sharing. Do your homework. If you want to support any legitimate charity, then do so directly. Never support any celebrity foundation. They spend most of their funding on PR campaigns, exotic travel, and high end accomodations for themselves. Thats right. Filthy rich public figures have been jet-setting the world in the name of 'humanity' for years. Riding in personal jets, staying in super-exclusive resorts, and living it up in exotic locations around the world the likes of which most people could never afford even if their lives depended on it. They bring along agents, advisors, publicists, hair, make-up, wardrobe, lighting, and photo crews who are also in it for themselves. They are paid six or seven figures for their part to schedule, manage, document, showcase, praise, and publicize the 'good will' of said public figures and their respective industries. Every possible expense is passed of as 'incidental' or 'necessary' and billed right back to some 'foundation' named after said public figure and/or respective industry. Every possible tax deduction is claimed. Which are incredibly vague and diverse thanks to our sold-out government. Deals are cut with major networks who agree to praise the 'good will' or 'humanitarian' effort of said public figures and plug their latest commercial project around the same time. Others from around the world pick up the story and save these industries billions in advertising every year. Resulting in higher profits and paychecks for the 1% club. When its all said and done more wealth is transfered from poor to rich. NOT the other way around. So don't support any charity named after a living celebrity. Don't be fooled by any affiliation or inspired by any short term short sighted progress report. Instead, go to Charitywatch.org and look up a top rated charity to support your favorite cause. Its all there. For example: 'Habitat For Humanity' is a top rated charity. They operate with a low overhead, volunteer workforce, and donated materials. They have built homes for the less fortunate in nearly every city nationwide. Including New Orleans. They do so as we speak. No similar effort can match their progress hour for hour or dollar for dollar. So there is no legitimate reason to support a slower, less efficient effort represented by a filthy rich Hollywood actor who flies in on a personal jet, takes most of the credit, and makes a deal with a major network for plugs just days before the premier of his latest film or DVD release. By doing so, you support not only the effort, but also the filthy rich actor. Concentrating more wealth and dumbing down our society further in the process. Instead, support 'Habitat For Humanity'. Its not perfect. It is affiliated with some big business. However, it is MUCH more efficient, effective, and less corrupt than 'Make It Right'. The difference is profound. In general, support the little guy as much as possible and the big guy as little as possible. Keep your own greed in check. Don't play the lottery and don't invest only for profit. If you do come into a fortune, then give away the bulk of it to others who have far less. Find the courage and do it. STAY OUT OF THE 1% CLUB. Encourage others to do the same. Their standard is obscene, unjust, illogical, and immoral. There is no excuse for it. Do your part to reverse the transfer of wealth away from the rich and back to the middle and lower classes. Otherwise, there will be no economic recovery EVER. Unfortunately, there is no perfect answer. Jobs will be lost either way. Families will go cold and hungry either way. Innocent children will starve and die either way. But we need to support the largest group of workers with the most reasonable profit margins. We need to stand for a more reasonable distribution of income, bottom line wealth, and resources. We also need to support LEGITIMATE charities (Check that list at Charitywatch.org). This is our only chance to limit the severity or duration of the comming US/global depression. In the meantime, don’t listen to Bernanke, Paulson, Bartiromo, Orman, Dobbs, Kramer, Pickens, Larson, O'Reiley, Limbaugh, Bruce, Inghram, or any other public figure with regard to the economy. They are all plenty smart but I swear to you that they will lie right through their rotten teeth. IT MAKES THEM RICHER. These people work for big business. The ‘experts’ they cite also work for big business. They are motivated primarily by their desire to accumulate more wealth. THEY WILL LIE RIGHT THROUGH THEIR ROTTEN TEETH. So don’t fall for their tricks. Instead, look at the big picture. The economic problems we face have been mounting for well over 20 years. All of them caused or aggrivated by a constant transfer of wealth from poor to rich. Soon, it will cause the first ever GLOBAL DEPRESSION. Its not brain surgery. For the mostpart, Its simple math. Like I said, you are welcome to copy this entry and run it by any professor of economics or socio-economics. Ask them specifically about the link between distribution of wealth and economic stability. If thats not good enough, then look up what Albert Einstein had to say about greed, excess, extreme wealth, and its horrible concequences. I speak the truth. GREED KILLS. IT WILL BE OUR DOWNFALL.